Effective advocacy work requires CASAs to take cultural competency seriously. Our training manual cautions, “What you do not understand may lead to inaccurate interpretations.” One way we can appreciate an unfamiliar culture is through the medium of good storytelling. A talented author can use words to paint a cultural experience that can memorably enlighten the reader’s heart and mind. 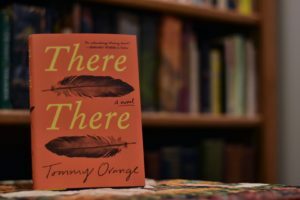 There There: A Novel, by Tommy Orange, is an example of informative and impactful storytelling. There There shines a literary spotlight on contemporary experiences of being American Indian. After laying the groundwork with a historical prologue, Orange skillfully weaves together the stories of twelve protagonists. Raw and painful experiences of suicide, domestic and non-domestic violence, and addictions are seen as behaviors that are negative responses to a deep historical grief. Other behaviors point toward hope and healing. Throughout the novel, storytelling is seen as a gift to be nurtured. Another example of hope is the comforting connections found in the beating of a drum and powwow dancing. But, the strongest healing is to be found in the shelter of each other. In Orange’s story, the experience of community is depicted in the climax of a powwow. It is the “there” where even the most damaged souls find their identity. There There invites the reader to listen, to care, to squirm, and to empathize – to feel with. Pain that has existed over the course of hundreds of years is difficult for those outside of the experience to appreciate. Reading There There provides practice in becoming still and listening. In the course of our work as CASAs, we need to use this skill as well. This may be hard, even uncomfortable at times, but it is good and important work. Poet David T.W. McCord penned, “True books will venture, dare you out, whisper secrets, maybe shout…” There There is a “true” book that dares the reader to take a literary leap into a harsh and heartbreaking world. Orange has provided an opportunity to grow in our cultural competency, to respect the journey of those wounded in the wake of the trauma, and to empathize with those who suffer and yet find a way to go on. Ready to grow in your knowledge, respect, and empathy? CASA’s can read this and receive 3 hours of continuing education credit. Orange, Tommy. There There: A Novel. New York: Knopf, 2018.